I recently watched Amelia Liana's video with Claire Marshall about their "Top 10 Game-Changing Products," and it really got me thinking about what some of mine are. We all have those products that it seemed that the first time we used them, everything just clicked into place. For me, I didn’t really get into beauty until about two years ago, so these “aha” moments probably happened later than most people’s. The thing that totally changed my skincare routine was the Body Shop Camomile Sumptuous Cleansing Butter. I don’t even remember what I was using to remove my makeup before I found this - probably some form of face wipes (cringing forever). But this really just melts all traces of makeup away, even the most stubborn waterproof mascara, without having to rub or tug at the skin too much. My skin is definitely happier that I’ve been using this - I’m on at least my fourth tub now. Another skincare staple that really changed the game for me was the Pixi Glow Tonic. Everyone raves about this, but for good reason. I had never even heard of acid toners until last year and scooped this one up to try due to the hype around it. It instantly transformed my skin from clogged, congested mess to clear and smooth. I was afraid of using acids to exfoliate before trying this as I have quite easily irritated skin, but I’ve found that it’s much gentler than a manual scrub and I’m left with better results. In the year I’ve been using this I’ve really noticed a difference in my skin - bad acne scars have faded, and while new spots still leave scars, they fade much more quickly than they used to. I don’t think I’ll ever be without this. The last bit that I guess fits into the skincare category is the Bite Beauty Agave Lip Mask. Before I got this I was a bit of a lip balm hoarder (see my Favorite Lip Treatments post for evidence - this was right when I first started trying the Agave Lip Mask. Also don't laugh because it was one of my first posts on this blog), but now I only have two or three I go between. Before I tried this, my lips were super sensitive and I would get random allergic reactions to products for no reason - sometimes the Nuxe Reve de Miel would be heavenly to use, other times I would develop a painful rash at the corners of my mouth. This lip mask seemed to completely turn that around - I use it every night without fail (in fact, I can’t fall asleep without it on), and I always wake up with smooth, moisturized lips. A tube has lasted me for a long time too - I’m just now finishing my first tube that I started back in September, and again, I slather on a good amount of this every night. 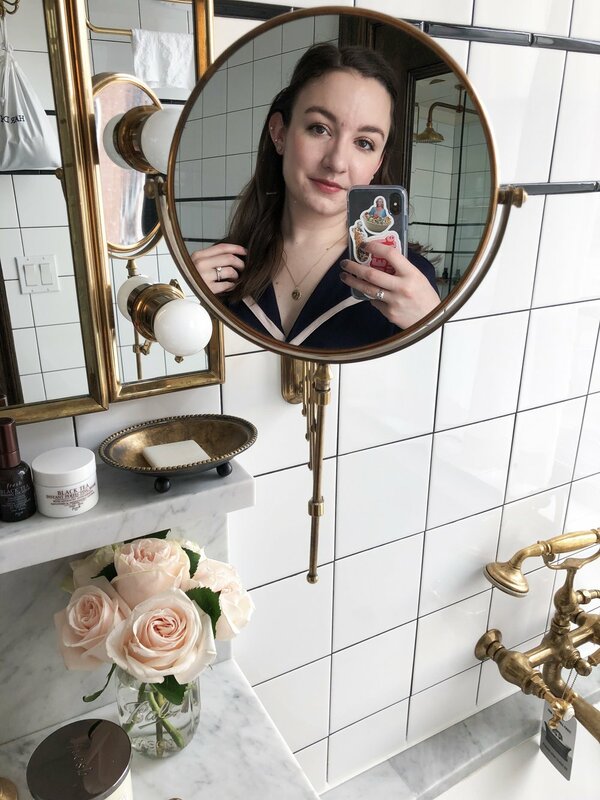 Realizing what I truly look for in a makeup product has been more of a gradual process, but I still have three products that really stand out. Before I tried the bareMinerals Complexion Rescue, I thought I had to compromise good coverage in a tinted moisturizer-type product for something that was actually moisturizing. Depending on my skin on a given day, even my favorite tinted moisturizers could feel a little chalky and tacky. The Complexion Rescue, however, is a very lightweight gel-cream hybrid that feels so nourishing on the skin. It gives great coverage as well - I’d say it’s almost up there with the NARS one. I really love that it smooths over any dry areas and quenches my skin’s thirst while still evening out my skintone. And it leaves the most beautiful glow that’s never tacky, score. Speaking of a beautiful glow, starting this spring I’ve really been after that perfect glowy skin. The area of my makeup collection that’s grown the most quickly (besides those neutral lip products) has to be highlighters. I just didn’t get them at first, finding many I tried just too glittery or too bronze-y gold. Enter the rms beauty Living Luminizer. I had heard this mentioned loads of times on just about every Into the Gloss Top Shelf, but it took me such a long time to finally get my hands on it. But now I know what I really need to look for in a good highlighter. It leaves the most beautiful sheen on the skin rather than a discoball glitter effect, and every highlighter I get my hands on now gets compared to this. It really is the best of the best for a natural, yet still noticeable glow, and despite getting quite a few more after this that I love, this is still the one I reach for the most. Lastly is the Anastasia Beverly Hills Dipbrow Pomade. I spent the longest time as a loyal customer to the Brow Wiz, but I think I’ve finally left that behind in favor of the Dipbrow. I was finding that with the Brow Wiz, it was quite a bit too easy for me to end up drawing on very blocky brows (and now I have to live with those awkward brows in all my graduation photos from last year, whoops). Even when I don’t take the time to draw on individual hairs with the Dipbrow (which I love to do when I have lots of time to get ready), the result always comes out so much more natural for me. I think I’ve really gotten the hang of it now, and I’m pleased to say I think I’ve had a “good brow day” every day for the past month now (really hoping I didn’t just jinx myself there). What are your “game-changing” products?